Drivers could be automatically registered to vote when they apply for their license, according to a proposal under consideration by a voting rights task force in Montgomery County. Current federal law requires Motor Vehicle Administration employees to ask customers if they would like to register to vote or update their voter registration information during their driver’s license or photo identification card applications. Montgomery County Council President Nancy Navarro, D, is spearheading the task force. A resolution calling for measures to expand voting participation in the county and the state was unanimously approved by Montgomery’s nine-member council in September. The proposed members of the task force are at the bottom of this story. Switching to “opt-out” voter registration was the only item the council’s resolution explicitly charged the task force with considering that would require action by the Maryland Board of Elections or the General Assembly, according to Ken Silverman, senior legislative aide to Navarro. While local governments have limited authority in making election law, Montgomery has been known to be a catalyst in affecting state law. All of Montgomery County’s elected officials are Democrats, including its 32 state lawmakers. The Democratic Party also controls the governor’s office, the Senate and the House. If passed, Maryland’s voter registration policy would change from an “opt-in” system – where people are asked if they would like to register – to an “opt-out” system, where they would be registered to vote unless they asked not to be. The Maryland Republican Party said it would oppose the policy, and several Montgomery County lawmakers have also weighed in. An effort to change the law could prove to be problematic. The council is set to vote on the 15-member task force group Tuesday (Nov. 26). An interim report with recommendations is due to the council by Feb. 28 and a final report by May 31. “There are definitely concerns that are flagged with opt-in programs and opt-out programs,” said Del. Jon Cardin, D-Baltimore County, chairman of the House Election Law Subcommittee. Cardin is running for attorney general in 2014. Beginning Jan. 1, Maryland will move to a new driver’s license system where it will begin issuing undocumented immigrants living in Maryland driver’s licenses and identification cards. 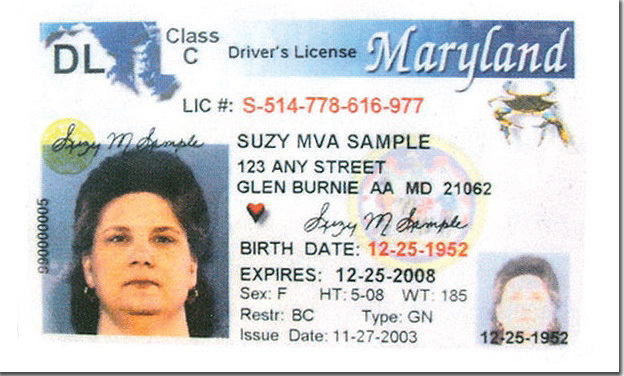 The words, “Not acceptable for Federal Purposes” will be printed at the top of each state issued license or card, MVA spokesman Buel Young said. Undocumented immigrants must also schedule a meeting with MVA staff to begin application proceedings, and a voter registration script MVA officials use for eligible voters would not be used with federally non-compliant driver’s license holders. Navarro aide Silverman said some recommendations may not make it in time for the 2014 legislative session, which is scheduled to end in April. The 2014 legislative session convenes Jan. 8. The deadline to introduce bills in the Senate is Jan. 31 and Feb. 7 for the House of Delegates, but exceptions are routinely made for late introductions. The 15-member task force and the Montgomery County Board of Election ex-officio member will be voted in by the Council Tues., Nov. 26. The task members are: Zaida Arguedas (D), John Britton (D), Michelle Kanter Cohen (D), M. Cristina Echavarren (D), Gary Featheringham (R), Richard Jurgena (R), Lindsay Eyler Kaplan (D), Gertrude “Dolly” Kildee (D), Lawrence Lauer (R), Takoma Park City Councilman Timothy Male (D), Catherine McDermott (Unaffiliated), Stephen Mortellaro (D), Mary Rooker (Green), Barbara Marsh Sanders (D). There are nine Democrats, three Republicans, one Green Party and one Unaffiliated Party members making up the task force. Male will serve as chair and Featheringharn will serve as vice chair. Alysoun McLaughlin, deputy director, Montgomery County Board of Elections will serve as an ex-officio member. The City of Takoma Park allows 16-year-olds and non-U.S. citizens to vote in municipal elections.